When you have a weak, damaged tooth, a dental crown may be the right restoration to give it back the strength and durability it needs. Tooth-weakening damage can happen from something as simple as biting down on hard food or can happen when you have a large cavity or root canal therapy. To keep things from getting worse, a crown is installed to cover and perhaps help hold together the tooth. When a tooth is badly damaged or decayed, a crown may be the only type of restoration that can save it. In every case, a portion of healthy tooth must be removed to make room for a stable crown, but this is a necessary part of having a crown placed. 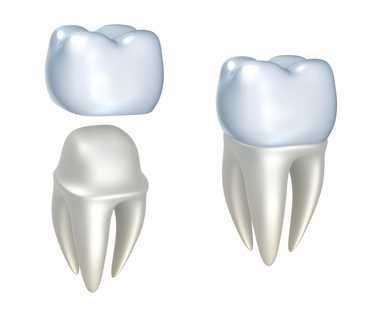 In some cases, it may be necessary to add material to your natural tooth to make a stable base for the crown. This can include composite filling material and perhaps a metal post. The top part of a dental implant is essentially the same thing as a dental crown. Crowns may be used as anchors for bridges, which are artificial teeth that cover one or more spots where teeth are missing. Every dental cap is custom-made, so Dr. Woods here at Brighton Dental in San Diego will take an impression of the prepared tooth, send it to a lab and then install the crown when you return for a second visit. Dental crowns can be made of many things, but we often use crowns made of zirconia. A cap can prevent you from needing an extraction in many cases because it can save a tooth that could not be saved any other way, including a cracked tooth or a tooth with much of its natural crown eaten away by decay or broken away by injury. A temporary crown is necessary while you wait for the custom crown to be made, but the final crown is permanent and is cemented into place so that it will not come out. If you take care of your teeth, your dental crown can last up to 15 years or even longer before a new crown or another type of restoration is necessary. A crown must be replaced if it shows too much wear, cracks or is damaged and can be replaced if it becomes badly discolored. A crown or cap covers a tooth’s entire exposed surface to restore the original shape and size – or a more desirable shape and size if needed. We almost always install tooth-colored crowns that are designed in a lab to precisely match the color and other characteristics of your natural teeth and other restorations. Crowns can be used for broken fillings, to replace very large fillings, for cosmetic improvement of misshapen teeth and more. Why not speak with us about dental crowns and learn how a crown can save a tooth you thought might not be salvageable? Dr. Woods can’t save every tooth, of course, but our team here at Brighton Dental are experts in gently restoring beautiful, natural-looking smiles and improving your overall look and function. As a biocompatible dental office and a holistic dentist, we strive to create dental solutions for you that fit your life and your needs. Contact us now for an appointment. Or read more about this restoration option on our Dental Crowns and Caps page. For every dental problem, we have a gentle, reliable solution and can offer you an excellent dental office experience you won’t mind at all.